specifically speaking a basic heading element here. 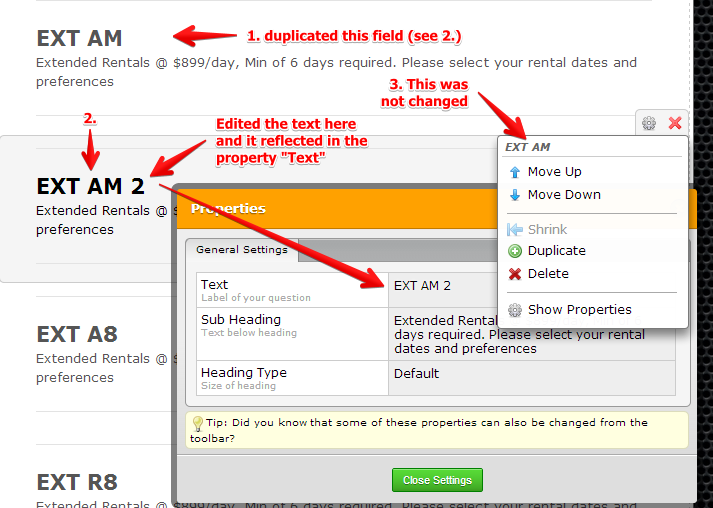 all actual headings have been edited after duplication, but the names from the drop down gear sign and for identification within conditions section need to be manually triggered to change by right click gear, properties, double click title of element which is already changed so it becomes editable, then do not edit, and just click close.... which seems to me to be a bug rather than intended design because it is unebelivably painful to build anything more sophisticated than your typical contact forms or short surveys. Im dealing with 3 x 37 duplication here for 3 sub segments related to 37 items that the business has on inventory and it is taking forever to finish this rough draft form just because of these little annoying issues. Please check it out and provide a fix if at all possible. See no 3. as the issue you meant to describe. You are correct that it is a possible bug. 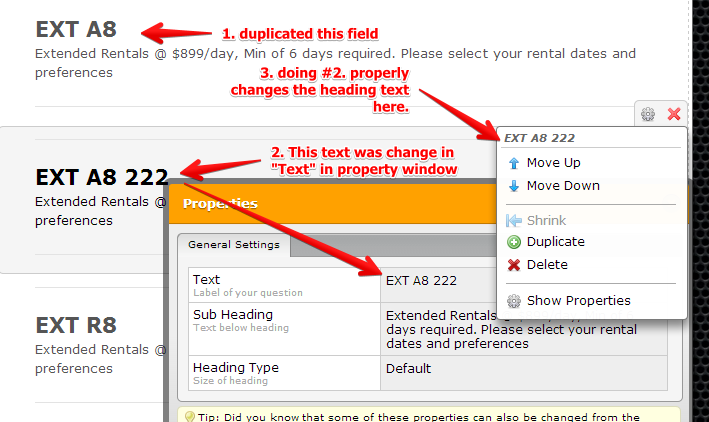 Because if you properly edit the "Text" within the duplicated fields property, the element header in gear icon will change accordingly. Inform us if this is not what you were trying to describe. So far, I could not find yet how this affect the form's other functionality. If you have already discovered the effect, it will be highly appreciated if you can mention so we can immediatly test the scenario. yes. that is exactly what im talking about. i had to change all of those TWICE manually. one actually through the lines and the other via the show properties windiw. the title on the element's right click drop down and in the conditions list would not change until i manually changed it... which is a shame. so in effect, if one cares to setup conditions, this will slow down the process significantly as it did in my case. i had to go in and rename some 200 lines via the right click properties tab because when i duplicated them and changed the internal content (heading and sub) it did not affect how the system identified it with its title. also, another related bug was just discovered. similar to this situation, i had lines in my form that included the "&" figure, throwing off some of my conditions. Then, per the instructions i got there, i changed the & to "and" across the board... TO NO AVAIL! until i remembered that jotform's digital memory is not that good at relearning and updating stuff... so i went to conditions section again, looked at my rules, and sure enough, the updates with regards to &s had not been reflected and the conditions still showed the older text including &. this resulted in this fix not to work unless i fixed it twice, once on the form, once within already set conditions. which is odd and weird. if you look at my form, for sake of not getting lost, i had to code name some lines which means i have to change their text once all is set and done... i hope i dont have to go through similar nightmares then. please look into fixing this bad memory situation of the system, it should update EVERYTHING related to the piece being edited, live, and across the board, but it does a half job on this as far as i can tell on multiple fronts and examples. For future enquiries, we would appreciate if you open a separate thread for each single problem so we can treat them indvidually in a more effective way. Recently a fix released about this issue, seems to be working now. Please check and see that problem is gone.